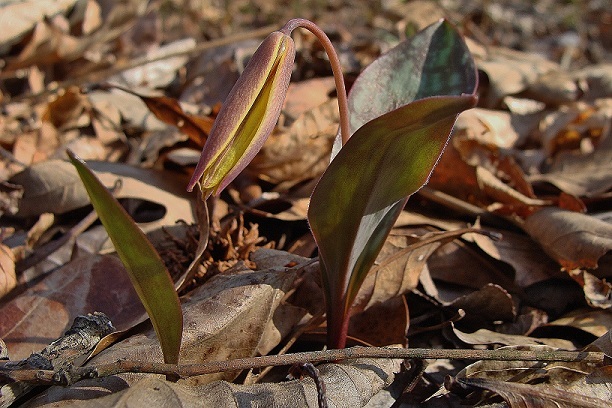 Trout lilies of the Liliaceae (Lily) Family are small, herbaceous, early-spring-blooming perennials. Preferred sites are deciduous woodlands and along streams in deep moist loamy soil. Deep-seated corms with fibrous roots produce additional plants a few inches away so that colonies develop, but generally only a few plants bloom. Plants, depending on whether a flower stem forms, have two leaves (with flower) or one leaf (no flower). 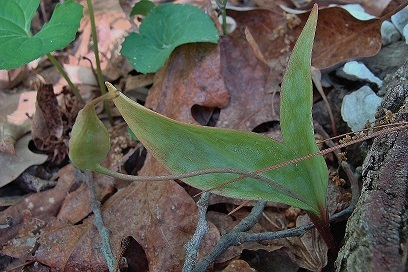 Leaves are lanceolate to ovate and basal, slightly folded with smooth edges. Fresh leaves have a mottled green, brown and silver coloration (trout-like) on upper surfaces and green under surfaces. All surfaces of leaves and stem are hairless (glabrous) and upper surfaces appear waxy. A single lily-type flower blooms for a few days. Stigmas have three rounded lobes which spread outward. Flowers are purplish on the outside. Flattened seed form in a chambered capsule. Leaves wither quickly after seed-set. Plant stems may reach ten inches tall. 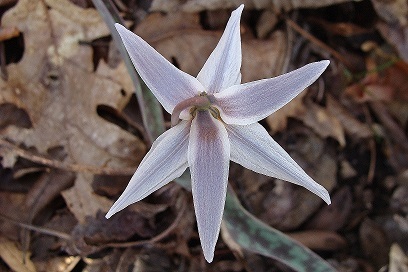 White Trout Lily (Erythronium albidum) occurs from Texas to South Dakota and from New York southwestward to Alabama. In Arkansas, found primarily in the highlands of the northwestern half of the state with widely scattered occurrences elsewhere. Nodding flowers have white sepals and petals which recurve revealing protruding yellow stamens. Inside base of sepals and petals is yellow. 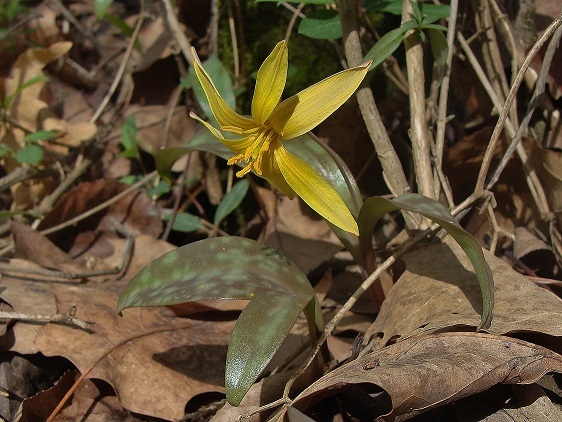 Yellow trout lily (Erythronium rostratum)* is less widespread than white trout lily, occurring in some southern and mid-western states. 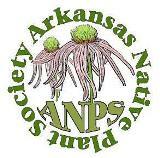 In Arkansas, primarily in the Ozarks, Arkansas River Valley and Ouachitas. 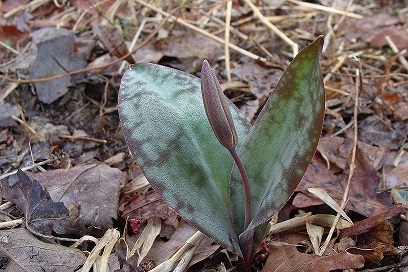 Yellow trout lily with two leaves and flower bud beside a second plant with one leaf. Flower of yellow trout lilyshowing yellow anthers and spreading sepals and petals. To view a photo of an unusually prolific flowering of E. rostratum see “Neat Plant Alert: Yellow Trout-Lilies at Bell Slough” dated April 24, 2013 at this website. 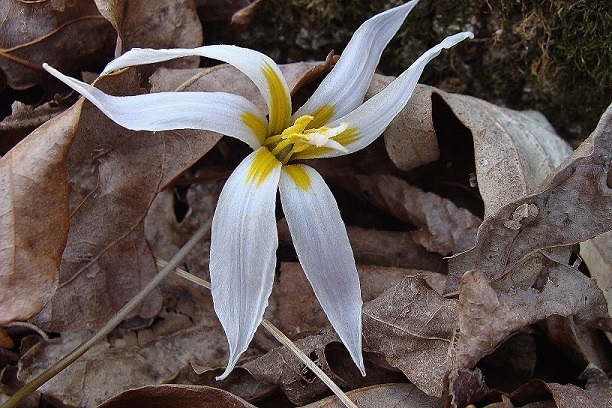 This entry was posted in Know Your Natives, Native Plants, Wildflowers and tagged Erythronium, Erythronium albidum, Erythronium rostratum, Liliaceae, Neat Plant Alert, trout-lily, White Trout Lily, Yellow trout lily. Bookmark the permalink.